KEYS: We have the largest selection of key blanks around, over 10,000 in stock. Looking for that hard to find blank come visit us we probably have it in stock and if not we would gladly order it for you. SAFES: We service most all major manufacturers of Safe containers. Hollon, Gardall, Sentry, Amsec, Liberty Winchester, Cannon, Browning just to name a few. We have equipment to move safes and file cabinets, call us for a free estimate. Safe openings on both standard dial and touch pad style locks. We have used containers for sale and can order new containers from the small deposit safes to you large gun safes. SECURITY: We install wireless security camera's on both residential and commercial properties. COMMERCIAL: Rekeying and setting up of a new Master or Master/Grand Master key system . Don’t carry around a ring of keys when you can have one key to operate all your locks. Restricted keys and High security cylinders available. If your concern with having to many keys out and fear other have had keys duplicate change that cylinder and install restricted cylinders. 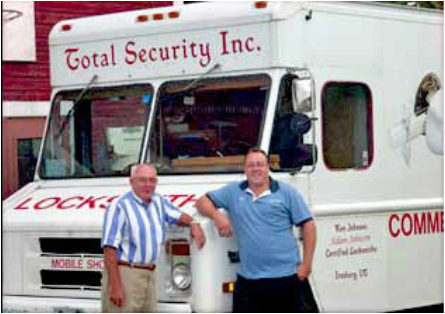 Total Security has options to give you keys with restricted keyways, meaning that they can not be duplicated at the local hardware store or Box store. Giving you peace of mind that the keys that you gave out to your business or home can not be duplicated. RESIDENTIAL: Total Security can install new locks and deadbolts in your house. All work done a very professional manner. Deadbolts can be added and match up to the existing locks so one key will operate all of the locks in your home. No need to fumble trying to find the right key.